All burgers and sandwiches are served with kettle chips. • Sub fries to any meal for $1. • Add side salad or cup of soup for $2.75 Gluten Free Buns available for $2 extra. Includes coleslaw, mashed potatoes and biscuit. • There is a $0.50 per piece upcharge for all white meat. 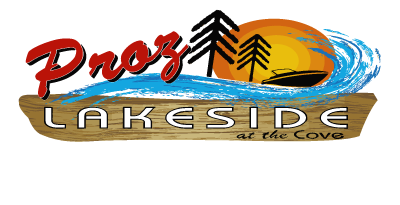 Proz Lakeside steaks are all cut in house, and hand selected, to give you the best quality possible. Charbroiled to your specifications. • Steaks are served with vegetable medley, choice of soup or salad & baked potato, seasoned red-skin garlic mashed or fries. Choose from any of our salads: mandarin tuna, strawberry spinach, grilled or crispy chicken, or apple chicken salad.